- RPSI trains updated for 2018. - Cavan and Leitrim Railway dates for 2018. - Waterford & Suir Valley dates for 2018. 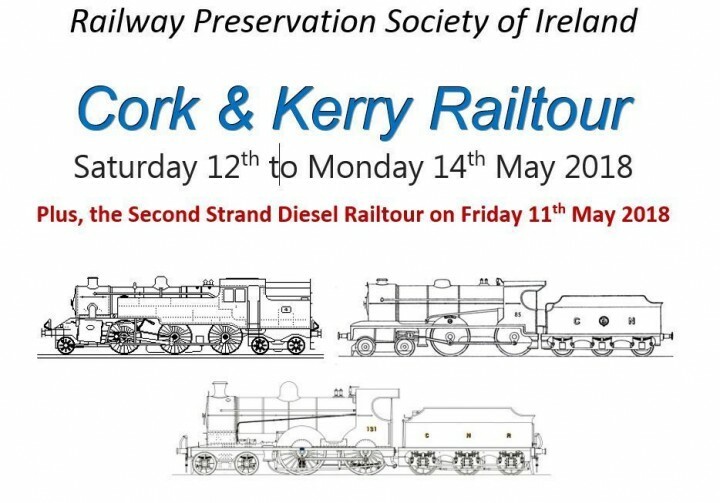 The Railway Preservation Society of Ireland was formed in 1964 to preserve Irish steam locomotives, carriages and rolling stock and operate them on the Irish railway network for everyone to see, appreciate, enjoy and travel on. 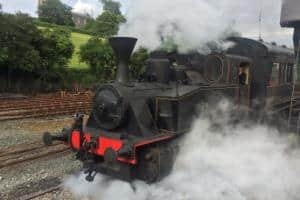 The society currently has over 1,000 members from all across the world and depends on its volunteers to keep its stock of steam trains operational. See the RPSI website for full details of their forthcoming special train services. We have an exciting line-up of trains for you to choose from, all of them along glorious cliff-side scenery and seaside views. All the while travelling in beautifully restored carriages behind an iconic steam locomotive. (4) Wheelchair users please contact us in advance to confirm that we can accommodate you. Each year the RPSI operates a weekend international railtour. This is something a little bit special, where we invite you to join our restored locomotives on our train across Ireland. With a full bar on the train, beautiful scenery, comfortable carriages and a traditional friendly welcome, our tours are fun and relaxing and a great way to see the Emerald Isle. Includes visits to Belfast, Dublin, Killarney, Mallow, Tralee, Whitehead. Thursday 10th May: Steam hauled positioning train from Whitehead to Dublin (one way). 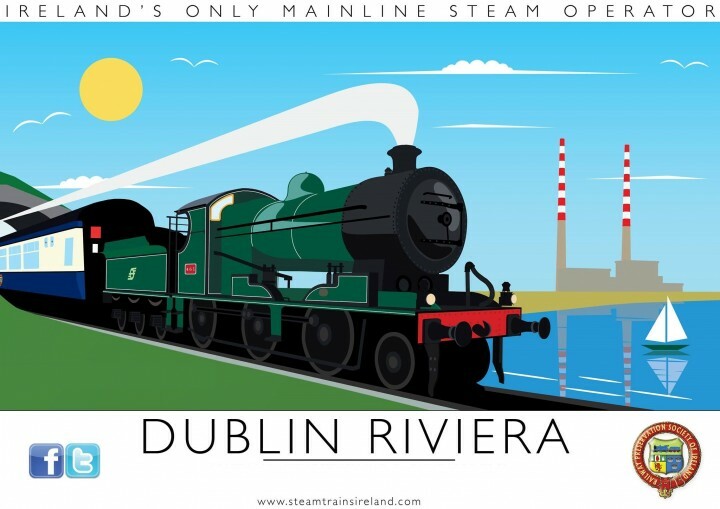 Friday 11th May: Second Strand diesel railtour: Dublin Connolly - Rosslare - Dublin Connolly. Tuesday 15th May: 131 Renaissance: Tour based on the lines from Belfast, hauled by newly-restored steam locomotive No.131. Please see the booking form for preliminary details of fares and itineraries. Return of the form (by post or email), with the appropriate deposit, will ensure you have a place reserved on the main railtour and/or the Friday diesel tour. Hotel accommodation is an optional extra, and the form allows you to indicate on which dates you may require accommodation. Due to overwhelming demand, bookings for the main railtour (Saturday-Monday) are now closed. Regrettably, further bookings must be declined. Bookings remain open for the Thursday, Friday and Tuesday trains. Please note that all trains and itineraries are subject to change and to agreement with the railway companies. 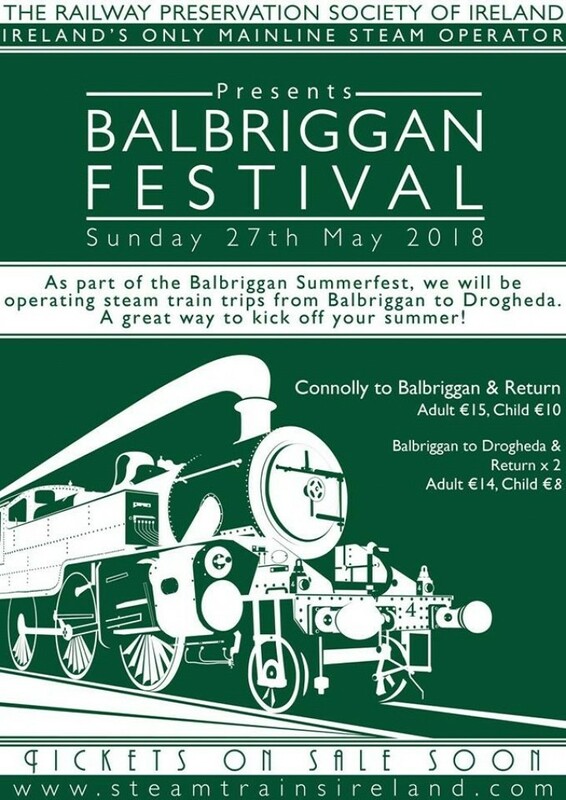 As part of the Balbriggan Summerfest, we will be operating steam train trips from Balbriggan to Drogheda. A great way to kick off your summer! From 1985 to the present day, DCDR has grown from a small band of determined enthusiasts working in a field, to become the only full-sized mainline heritage railway anywhere in Ireland. For further information on the events listed below please visit the Downpatrick and County Down Rialway website. 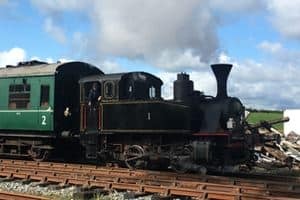 We’ll be running trains in connection with the St Patrick’s Landing event at Inch Abbey, kicking off a week of celebrations and events in the town. Trains will run from Downpatrick Station to take visitors to the Abbey, and back again when the event is over. 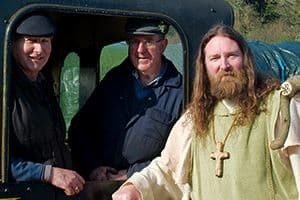 Park your car at Inch Abbey station and take a train trip straight into the town’s street carnival and join in the commemorations of the Patron Saint of Ireland. Heritage steam and diesel trains operate throughout the afternoon. Have an Easter break with a difference. 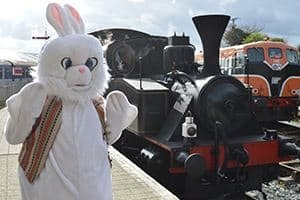 Take the train from Downpatrick to Inch Abbey, and meet the Easter Bunny. All children get a chocolate egg… if you get to them before our loco crews! 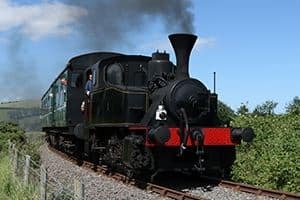 We’re running steam trains all weekend as part of the new ‘Down to the Races’ event, bringing together tourist attracts from across the Downpatrick area for two days of early summer fun and games. More details will follow soon. Saturdays and Sundays from 14th July to 9th September. 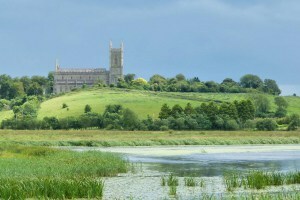 European Heritage Open Days event will run on 8th & 9th September – more details to follow. 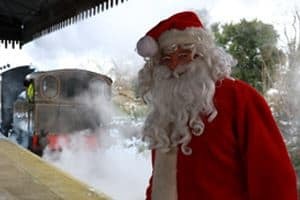 Relax after the hubbub of Christmas and New Year with a Mince Pie and journey through the Co. Down countryside on a train hauled by a heritage diesel locomotive. A great day out for the family, and also a highlight for any diesel fans out there. It was constructed in stages between 1969 and 1982 entirely by voluntary labour. Many of those who participated in this arduous task were full-time permanent-way workers from Coras Iompar Eireann, now Iarnrod Eireann. Through their efforts we have a well laid track and they continue to guide us with maintenance and renewals. The railway is a very popular attraction in its own right as well as being the only steam-powered activity for public participation during the rallies. 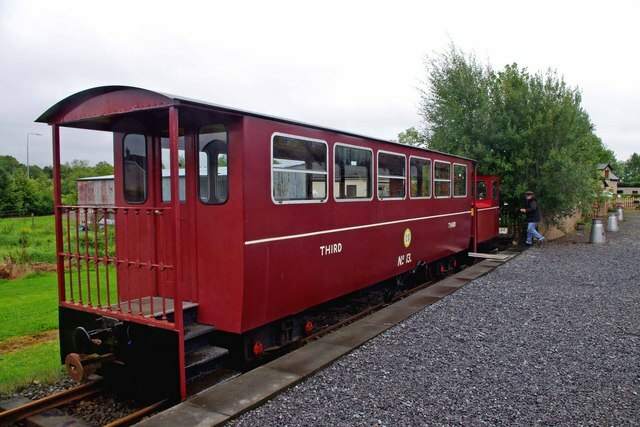 The track gauge is three feet (914mm), the same as most of the former narrow gauge railways which are firmly embedded in the folklore of the remote areas of Ireland which they once served. 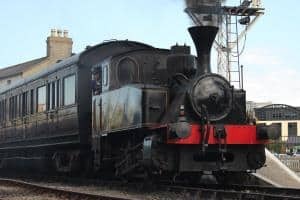 Our passenger trains are hauled by a steam locomotive. The veteran diesel locomotives are also available when required. Trains run as required 13.00-16.00 on all dates except National Steam Rally when the train runs from 13.30-17.30. Fares: Adults:€7 Children:€3. Tickets are valid for unlimited travel on day of purchase. Any additional operating dates will be posted on their website. Experience the beauty of the Suir Valley from a period carriage as you take in the panoramic views of the river,and rolling farmland of Waterford and across the river to County Kilkenny. The track runs mostly along the picturesque banks of the River Suir offering views of the world famous Mount Congreve Gardens. The Railway will operate daily from Saturday 24th March to 30th September 2018. * The Spooky Express. TBC Special fares apply and must be booked in advance. See W&SVR website for details. * Special fares apply and must be booked in advance. See W&SVR website for details. Tickets are not sold in advance. For further information please see the W&SVR website. The museum that was established in 1993, is run entirely by volunteers. The museum is located beside the Irish Rail station in Dromod on the grounds of the old Cavan and Leitrim Railway yard. Today 0.4 kilometers has been restored and remains preserved after its closure in 1959. Following the closure, all which remained in Dromod was the Station House, the engine shed and water tower. Today they have been restored and have been preserved. Opening for the 2018 season from April 1st. Nowadays, your visit includes a short demonstration journey on a full-scale diesel-powered replica of the original monorail. During the journey you will experience the unique features of the monorail and will observe its ingenious switching system. Before or after your journey, you can visit the Lartigue Museum to watch film of the original Lartigue and see models, displays and memorabilia of the Lartigue and main-line railways. Fare: No fare information available. For further information please see the Lartigue Monorail website. Operates June to September only. Information on the 2018 season will be posted when available. * Monday - Saturday - first train every day at 11am and then every hour on the hour until last departure at 4pm. * Sundays & Bank Holidays - first train at 1pm and then every hour on the hour until last departure at 5pm. For further information please see the Fintown Railway website. A trip on the train is the best way to see all of the Lower Gardens at Oakfield Park. Over 4.5km of narrow gauge track, weaves its way through the trees, revealing many pleasing vistas. The railway takes you around the lake and grounds passing the Castle Folly, the Tree Circle with the “Orb” and the newly installed “Long Sleeper” sculpture on the Spiral Mound before returning to the Station. 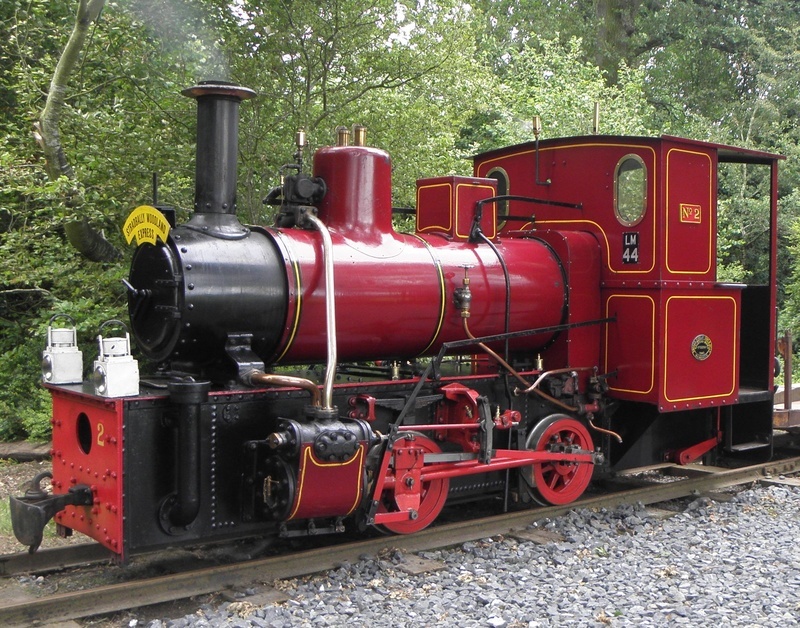 The ‘Duchess of Difflin’ steam engine, with her carriages in the traditional red and cream livery of the “Wee Donegal” and the ‘Earl of Oakfield’ blue diesel engine give pleasure to children and enthusiast alike. * Oakfield Park is open from 29th March 2018. * Trains run at the Weekends and Bank Holidays (regular intervals between 12 and 6pm) and at 2, 3 & 4pm on weekdays. * The Steam Engine ‘Duchess of Difflin’ runs on the last Sunday of each month ‘Steam Sunday’. For further information please see the Oakfield Park website. Drumawhey Junction ~ a miniature railway operating steam, petrol hydraulic, diesel hydraulic and electric locomotives. The line is the longest 71/4” gauge railway in Ireland. The layout allows a variety of routes. An interesting journey of approx 15 minutes is provided. The railway captures the atmosphere of a full sized railway. There is a station, signal cabin, engine and coach sheds, bridges, cuttings, tunnel and a level crossing. It's a great adventure! We are open to the public every first and third Sunday of each month 1300 to 1700. During July and August we are open every Wednesday and Sunday 1300 to 1700. Adult £2.50 Includes 1 ride on a Steam, Electric or Diesel locomotive. Child £2.00 Includes 1 ride on a Steam, Electric or Diesel locomotive. Family Pass £15.00 Includes 8 rides for the family on a Steam, Electric or Diesel locomotive. For further information please see the Drumawhey Junction website. 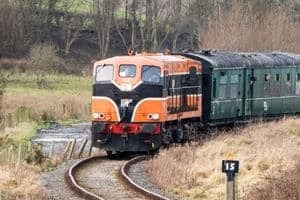 The Giant's Causeway and Bushmills Railway is a 3 ft narrow gauge heritage railway operating between the Giant's Causeway and Bushmills on the coast of County Antrim, Northern Ireland. The line is two miles long. Schedule: No 2017 or 2018 information available at time of writing (May 2017 & March 2018). It is strongly recommended that you try and contact the railway prior to travelling. 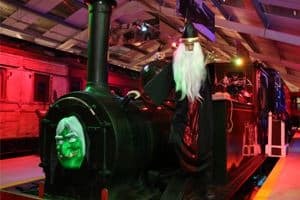 There have been several reports of people and families making the long trip to the railway only to find it closed when they arrive, despite the website claiming that they were to be open. For further information please see the The West Clare Railway website.